Team records are the difference in the Lions’ trip to Green Bay this season. The Lions (3-1) are tied with the Chicago Bears atop the NFC North while the Packers (1-2) have struggled out of the gate. Here are five keys for the Lions to break their 22-game (including playoffs) losing streak to the Packers in Wisconsin. 1. Aaron Rodgers must be pressured by the line which has been the strength of the defense. 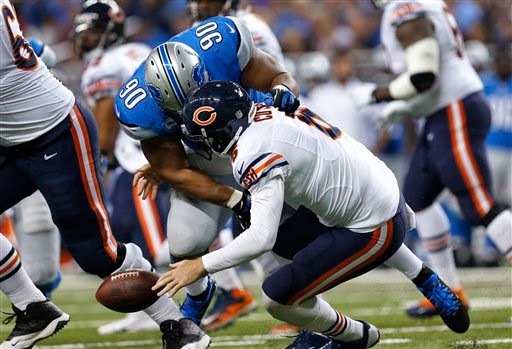 Like Jay Cutler, Rodgers can’t be rattled but he can be sacked on occasion. In fact, in the first three games he was sacked 10 times for a loss of 77 yards. The Packers’ left tackle David Bakhtiari is a rookie while right tackle Don Barclay is in his second season — this will be his 10th start. Rodgers has thrown eight touchdown passes and three interceptions. 2. Reggie Bush must keep being Reggie Bush. 3. Matthew Stafford must have a good game which would include getting off to a strong start. Last year he was 27 of 45 with one touchdown and one interception in the loss at Lambeau. 4. The Lions’ secondary must be in peak form. Chris Houston (hamstring) is officially questionable but it was a good sign that he practiced on Friday. Rodgers has three big targets in Randall Cobb, Jordy Nelson and James Jones. He’s thrown for 1,057 yards in three games. The defense must tackle well throughout. Missed tackles could equal missed opportunity. 5. Detroit’s offensive line must continue to protect Stafford and give him just enough time to get rid of the ball. Also to open the run lanes for Bush and Joique Bell. Prediction: Expect a close game with Detroit full of confidence and the Packers desperate to not fall to 1-3. Tough call here, but — Lions 28, Packers 27.